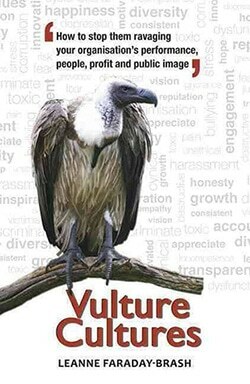 Vulture Cultures: How to stop them ravaging your organisation’s performance, people, profit and public image is now available to purchase online. After you’ve read this book you will never look at your organisation in the same light again! Vulture Cultures is a provocative and entertaining book that articulates, in vivid detail, the tell-tale signs and symptoms of destructive workplaces. From the incompetent to the incomprehensible, the disruptive to the dastardly, this book will explain how bad behaviour gains a foothold and what perpetuates it against all good common sense. The book provides both high-level strategies and readily applicable tips for the CEO and the change leader as well as the vulnerable and the victimised. Vulture Cultures does not dwell on the sociopath or the employee with a personality disorder. In truth, for all the sensationalist hype that surrounds them, they account for a very small percentage of the workforce population. All the characters, cultures and case studies are 100% real and based on Leanne’s 20-year history consulting. Leanne Faraday-Brash is an Organisational Psychologist, speaker, executive coach and facilitator with two decades of experience in organisational capability and culture, equal opportunity, conflict resolution, change, leadership, emotional intelligence and resilience. She has presented in Europe, the US, Asia, the Middle East and across Australia and has appeared on radio and television. Her expert commentary and opinion pieces are regularly sought for broadsheet and online publications. Leanne lives in Melbourne, Australia which is, in her humble opinion, the sporting, coffee and Arts capital of the world.